Réunion is a French island located in the Indian Ocean, east of Madagascar and south west of Mauritius. Administratively, Réunion is one of the overseas departments of France. Like the other overseas departments, Réunion is also one of the 27 regions of France and an integral part of the Republic with the same status as those situated on the European mainland. 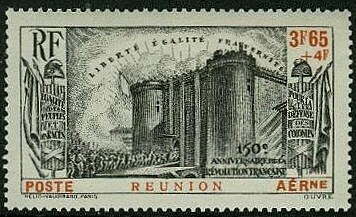 In 1939, the French celebrated the 150th Anniversary of the French Revolution by issuing semi-postal sets commemorating the storming of the Bastille. All featured the same common design, and were issued throughout their empire, usually in modest quantities. As omnibus sets go, the French Revolution set make a pretty good investment, as most of the former colonies for which it was issued are now emerging market countries. 14,972 of the Reunion French Revolution set (Scott #B5-9,CB1) were issued, with #CB1 being the key value. Scott '13 prices the unused set at $86.50 ($ 140.00 for NH) . The set has dual market appeal among collectors of French Colonies/Area and Reunion. With about 800,000 people, Reunion benefits from its special status as a department of France, and its main industries are tourism and sugar production. The island's GDP per capita was 23,501 US dollars in 2007, the highest in Africa. Annual GDP growth has averaged about 2.7% over the last five years.